A pumpkin carving set - intriguing - do take a photo! Will do, Sue! I wondered whether to put in a photo but decided there were enough already! 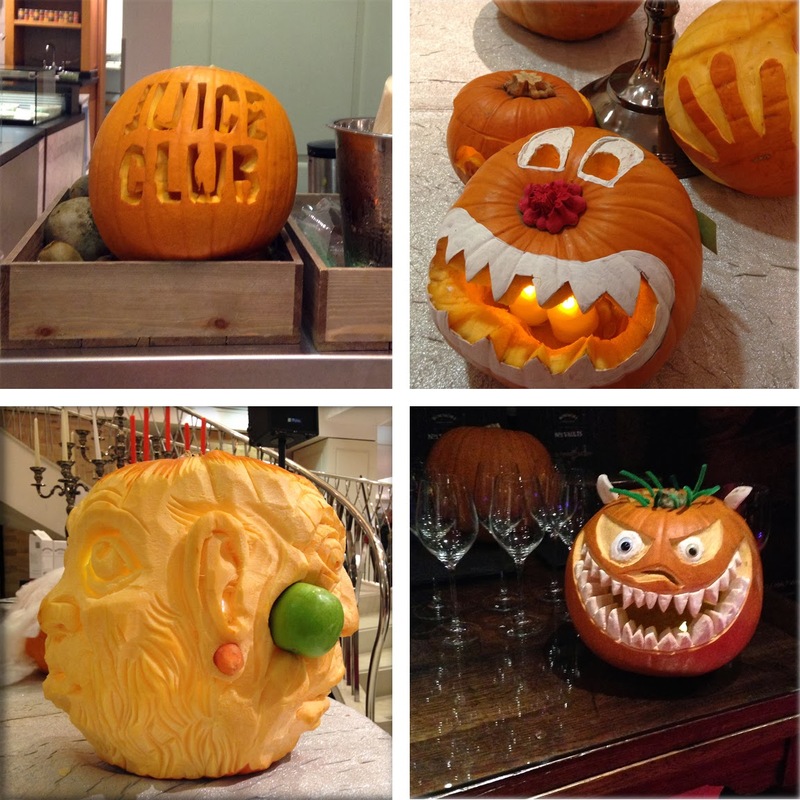 Pumpkin-carving has come on a lot in the last few years, evidently! An art-form in its own right, I would say. What a pity that in England pumpkins are used almost entirely for carving though, and not perceived as being a desirable food item! It seems we're very influenced by American traditions - pumpkin carving is a fairly recent thing. But with the tide of pumpkins, comes a dearth of pumpkin recipes as well. I had some delicious pumpkin risotto recently although I can give pumpkin muffins a miss. Gotta love those roasted seeds though! What a fantastic event. Everyone is so very creative. A shame there wasn't a first prize for your family this year. But no doubt you'll be back! We will indeed, CJ! Interestingly the most intricate carving was done by an international artist which rather puts the pressure on other entrants! Wow, I genuinely had no idea you could do so much with a pumkin! I suspect the combination of power tools and pumkin flesh would result in more mess than art if in my inept hands, but am impressed at your family's track record. I too love the Day of the Dead carving, spookily beautiful. Have I inspired you Janet? I gave away a lovely book of pumpkin carving a couple of years ago, full of ideas for beautiful, graceful carved pumpkins - not just scary ones! It's easier than it looks - I carve the outside then scoop out the innards with an ice cream scoop. Job done in minutes, although I can't beat the current record: 29 seconds! Lovely to see Emelia's spider pumpkin in pride of place in front of the royal crest! Although I must say I did love the big scary mouth on the winning pumpkin. I did actually roast and freeze the pumpkin flesh to add to soup! Oh what fun Caro. Sorry that your niece was not a prize winner this year - no doubt she will return with a vengeance. The 'Day of The Dead' carving is brilliant. Would that I had some carving skills in my finger tips. If I had a go I think that there might well be some suitable for the occasion blood curdling screams. Yes it was a very fun evening, Anna! Sometimes it's just the thing to step outside and see what the rest of the world is up to! I'm so impressed with the skill that goes into these carvings and, yes, maybe we'll all have another go next year! I think if you had a go, you might surprise yourself at how easy a simple carving is! Hmmm, perhaps a tutorial is needed. What a fantastic family event. I'd love to take my young daughter one year. Such wonderful carvings and now that you have your own carving set, we will see yours next year won't we?! Glad you had a good time! I've enjoyed all your Halloween pumpkin posts over the years and thought about you in the run up to Halloween, I wondered if your family would be giving it another shot. What a shame that Eme didn't take first prize, but well done to her on the fancy dress. I think her pumpkin looks fab in front of the royal crest, and if that's not giving it the seal of approval showing it off like that I don't know what is. I enjoyed reading about your unexpected visitor in your last post, I bet you thought you were seeing things. They are very impressive pumpkins. It does all make me smile. I had to make do with a swede as a child which my dad carved. Bless him, they aren't the easiest of veg to carve. Looking forward to seeing your entry next year. ;) It was quiet here too but then I don't think the weather helped. Your carved pumpkins are amazing, works of art. Thanks, Charlie! These are not mine this year but, I agree, they are indeed amazing! Thanks for popping by!